egypt tourism: How were egyptians built the pyramids? Researchers have uncovered one of the key methods the Egyptians used to build the pyramids. They have long been baffled by exactly how workers were able to transport large blocks of stone to construction sites. Now, they say the key was simple - wet sand. 'For the construction of the pyramids, the ancient Egyptians had to transport heavy blocks of stone and large statues across the desert,' researchers at the University of Amsterdam said. The team tried to replicate this - and found wet sand was the key. The Egyptians therefore placed the heavy objects on a sledge that workers pulled over the sand. 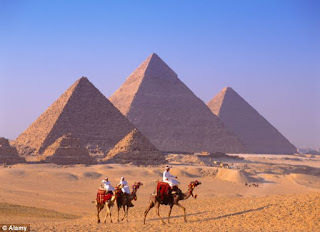 Research from the University of Amsterdam has now revealed that the Egyptians probably made the desert sand in front of the sledge wet. Experiments have demonstrated that the correct amount of dampness in the sand halves the pulling force required. To test the theory, the physicists placed a laboratory version of the Egyptian sledge in a tray of sand. They determined both the required pulling force and the stiffness of the sand as a function of the quantity of water in the sand. To determine the stiffness they used a rheometer, which shows how much force is needed to deform a certain volume of sand. 'A sledge glides far more easily over firm desert sand simply because the sand does not pile up in front of the sledge as it does in the case of dry sand. The also believe a painting reveals the trick. The research results could therefore be useful for examining how to optimise the transport and processing of granular material, which at present accounts for about ten percent of the worldwide energy consumption.